~Graphoanalyst Introduces A Possible Approach To Determine Traits Of A Bully And A Victim… A Review By Stefanie Sanchez – ReadersMagnet ~ | David J. DeWitt, C.G.A. Bullying is one of the most traumatic acts that one can experience in life. It brings tears and hatred. It can cripple you with fear and haunt you even during your sleep. And worst, it can forever leave you with a disturbed life. That is very unthinkable, but it’s true! The book, “Bullying: Applying Handwriting Analysis to Detect Potential Danger Signs and Effect,” gives us insights on the link between handwriting and the possible unlikely aggressive behaviour. The author openly introduces us to a very interesting hypothesis that is certainly essential and critical in this contemporary society. 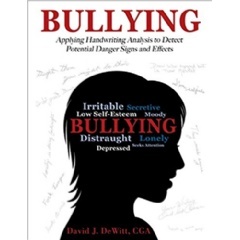 The book tells us how the analysis of handwriting can be help in the possible detection of potential personality traits of a bully as well as of victims of bullying. It also gives some personality trait examples and some of the warning signs of potential dishonesty. The author in this writing clearly presents to us the approaches and ways in analyzing the handwriting and evaluating the results to spot the possible projected patterns of behaviour. This is a must have book for those curious minds who want to learn and realize more about the relation between one’s handwriting and the possible patterns of behaviour. This is a very interesting read. “BULLYING: Applying Handwriting Analysis to Detect Potential Danger Signs and Effect” will be displayed in the coming 2017 National Education Association on June 30, 2017. Grab a copy and learn more! This entry was posted in Book Review, BULLYING-RYAN'S STORY, Handwriting Analysis, News Item, Uncategorized. Bookmark the permalink.